Making the most of the long hours of summer daylight, we climbed remote Slieve Carr via Nephin Beg S Top and Nephin Beg, returning to the Brogan Carroll Bothy in Letterkeen Woods along the Bangor Trail. A misty morn greeted us as we followed the green way markers for the Bangor Trail crossing a bridge over the Altaconey River and up a bracken fringed gully where clouds of midges approaching pestilential proportions drove us mad. Another bridge brought us onto open, steadily rising boggy ground offering good views of the rocky ridge of Coirin Beg Mountain and the vast Letterkeen forest, planted around 1951. At the corner of the forestry we left the Bangor Trail to follow the white Letterkeen Loop way markers uphill, enjoying emerging views of Lough Aroher below. Leaving this route we headed up the steep slope of Nephin Beg S Top, shrouded in grey mist. From its unremarkable summit cairn we headed down towards the boggy col for the pull up Nephin Beg with its more substantial cairn. From its summit we made the very steep descent toward the twin lakes of Scardaun Lough. The cloud lifted briefly offering fine views of the Slieve Carr ridge; the conical prehistoric summit cairn stood out like a pimple. Passing the inky waters on the lough’s sandy shore, we began the lung bursting climb up the viciously steep heathery side of Corslieve, squally rain showers sending us hurriedly into our storm shelter twice. Atop the ridge the emerald green sphagnum moss was absolutely saturated contrasting starkly with the deep brown of exposed peat. A pair of golden plovers called mournfully to each other in the mist. Close to the summit the terrain changed to a lunar landscape of angular grey rock. With nonexistent views, we took shelter to fire up our stove for morale boosting hot food and tea. Back on the ridge the mist lifted. Battleship grey clouds hung heavily above a thin ribbon of blue sky against which the smoky silhouettes of conical mountaintops on Achill island rose behind Blacksod Bay, its waters shining like quicksilver. Huge shafts of sunlight streamed down on a vast expanse of rose pink and emerald green Atlantic blanket bog hemmed in by a semicircle of mountains, myriad pools within glinting angrily like shards of a shattered mirror. 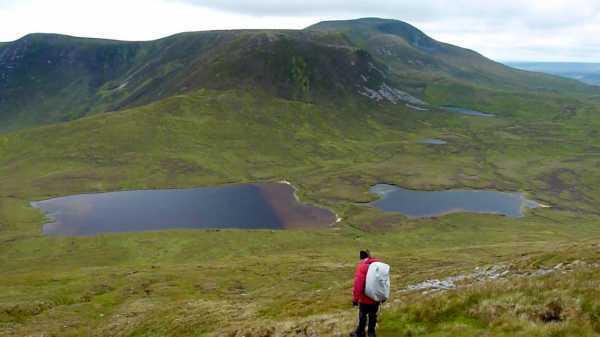 Faintly visible was the scar of the ancient Bangor Trail, an old drover path passing below the lofty slopes of these remotest of mountains; we headed steeply downhill to meet it near the cascade emerging from Scardaun Lough. The 9km trail back to the bothy passed over demoralising long sections of boot sucking bog, brackish pools and slippery stones. In the Bawnduff Valley we passed crumbling walls of pre-famine cottages and faint ridges of lazy beds, when hardier folk coaxed a meagre living from this aqueous land. We didn’t see a soul all day, arriving at the bothy 12 hours and 28kms later, dirty and exhausted, but utterly exhilarated by a day out in this wild, remote and beautiful corner of Ireland.